If you’re lucky enough to share your bed with a loved one each night then it only stands to reason that both of your need to be in on the process of picking a new mattress. As you head out to the local Durham mattress showroom you’ll be presented with many types of mattresses from the classic innerspring to a pillow top to a memory foam and even a waterbed (yes, they still make those!). There are even mattresses that can be split to accommodate the desires of two separate sleepers. What is important is that you take the time to test the mattress in the store. Lay down on the side you would normally lay down on and spend several minutes there to get a feel of the mattress. This is the Goldilocks test. You want to make sure it’s not too hard or too soft but just right. Even after you get your new mattress delivered to your home there will be a period of adjustment before your body gets used to it. Ideally you should give yourself at least three weeks for things to settle in. If the mattress isn’t working after that amount of time then you should consider sending it back and trying a new model. This is why you want to be sure the store you’re buying from has a decent return policy. While you’re at it, you might want to invest in a new pillow to match your mattress. 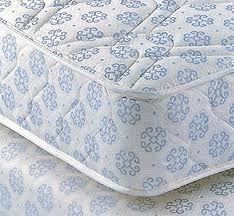 Before you can accept that new mattress you need to get rid of the old one. This is where a company like Junk King Raleigh can come into play. Many mattress sellers around the Durham, NC area offer removal but for a fee. Even though you’ll be paying for the Junk King services you’ll be getting a lot more than just a single mattress removal. When you hire Junk King they will be able to take away all your unwanted stuff in the same pickup appointment. This means you can get rid of the mattress, clear out the garage, clean up the basement and clear out the attic. Junk King Raleigh will provide you with a two-man crew and big truck to fill up. The possibilities for decluttering your home are endless. When the JK crew is done with removing stuff from the inside of your home they can do the same on the outside. This is your chance to clear out all the debris left over from the last storm or remodeling project. Whatever you’ve got to throw out, give it to Junk King Raleigh. And to think it all started with getting rid of your old mattress! This entry was posted in Durham Junk Removal, Durham Mattress Disposal, Raleigh Junk Removal and tagged Durham NC Mattress Disposal on September 27, 2013 by Britt Holcomb. Last updated August 1, 2017 .